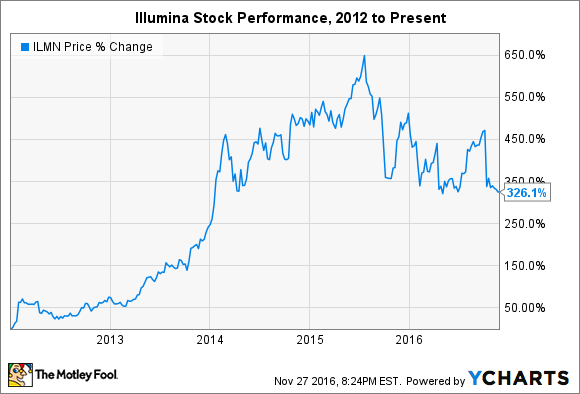 Can Illumina Regain Its Mojo? Since the DNA sequencing giant's stock hit its all-time high in 2015, it has fallen victim to volatility and pessimism about the company's equipment sales. The fact of the matter is that Illumina has continued to grow at double-digit clips quarter after quarter. The problem, it seems, is that investors are overly concerned with growth in instrument sales. For instance, when management forecast in October that fourth-quarter 2016 sales will be flat compared to the year-ago period because instrument sales will come in lower than originally expected, Mr. Market sent shares sharply lower. That may seem like the right metric to focus on for a company that claims it's leading a DNA-sequencing revolution, but instrument sales are only its second-most important source of revenue today, and they will likely soon fall to third. So when investors ask whether or not Illumina can regain its mojo, I think the answer is "yes" -- you just have to know where to look for the answer. If instrument sales are wrong, what is right? While the company sells plenty of sequencers and other lab machines each quarter, over half of its revenue -- and much of its growth -- is derived from selling the reagents, microarrays, and flow cells that are necessary to operate that installed base of instruments. For the first nine months of 2016, consumables revenue increased 22% year over year. Instrument revenue dropped 20%, and services revenue -- which could soon provide more revenue than instrument sales -- increased 16%. Total year-over-year sales increased 10%. *Numbers for first nine months of 2016. Source: SEC filings. The table above shows the growing importance of consumables and services revenue to Illumina's overall growth in recent years, as well as the gains it made in instrument sales. The major concern among investors seems to stem from the rapid decline in contributions from instrument sales to total revenue thus far in 2016. Investors are worried that growth in consumables will be dragged down by slowing growth in the installed base of machines from which the company can extract recurring revenue. That logic makes sense -- except when investors consider the types of instruments being sold and the amount of consumables revenue that can be generated from each. Sequencing technology and the market for it has changed since 2007, when instrument sales comprised 37% of total revenue, and even since 2012, when instrument sales comprised 27% of total revenue. The emergence of, and necessity for, next-generation sequencing (NGS) technologies has fundamentally changed the game. Researchers covet NGS because it provides more and better data per run and allows higher throughput than previous sequencing methods. Those improvements come at the cost of higher consumables requirements. In fact, some estimates peg consumables at two-thirds of the overall value of the NGS market. It shouldn't be that difficult to believe; consider the HiSeq X Ten, the company's $10 million sequencing system that could lower sequencing costs for a full human genome to $1,000. That remarkable figure includes $797 of consumables per genome. In other words, an installed based composed of more NGS machines and newer instruments is more valuable to Illumina, even if it comes at the "cost" of slower instrument sales than was historically the case. It's easy to see why investors would be alarmed by a warning that fourth-quarter 2016 revenue won't grow from the prior year's levels, especially for a stock trading at 60 times trailing earnings. But the recent concerns over slowing instrument sales seem nearsighted. The opportunities for near- and long-term growth in NGS markets should allow the company to continue growing consumables and services revenue even if instrument sales slow. That doesn't even include the budding opportunities in clinical diagnostics and consumer markets being eyed by management. Given the trends occurring in plain sight, albeit within the research communities that leverage the company's products, I think it's safe to bet that Illumina shares will rise again.